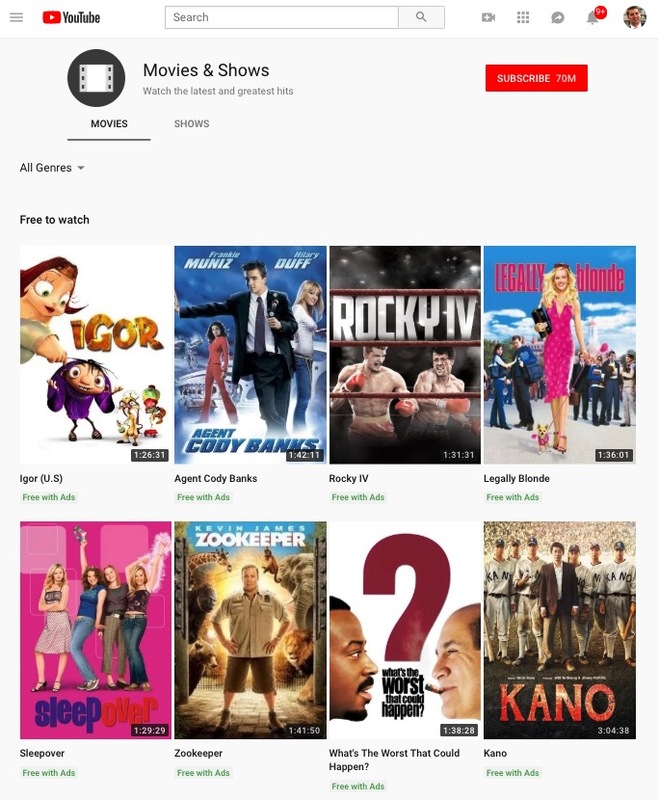 YouTube recently started adding free feature films on its Movies & Shows page that are available to the public, which is supported by ads in between scenes. According to The Verge, YouTube quietly launched this service last month. While the selection of films is limited, at least it is free and the ones that are included are some of the best classics like the Rocky series, Legally Blonde, Jiro Dreams of Sushi, The Terminator, Four Weddings And A Funeral, and Dirty Rotten Scoundrels. YouTube’s director of product management Rohit Dhawan told AdAge that the company saw this opportunity based on demand from users. Dhawan said that it also presents a “nice opportunity for advertisers.” And he pointed out that there may be a way for advertisers to “sponsor” films and hold exclusive screenings. As of right now, there are 100 films and it will expand soon. YouTube is not the only video service that is offering free films. TUBI TV, Sony Crackle, Walmart’s Vudu, and Roku are offering ad-supported movies as well. For example, The Roku Channel is available on the web and tablets in the US and a number of films are available on that service. The Roku Channel has films like The Perfect Storm, A Few Good Men, The Ides of March, Jerry Maguire, The Firm, The Bank Job, The Terminator, Gran Torino, etc. The free movie service on YouTube has also been compared to Hulu. I would say that may have been the case in the past, but now Hulu charges $7.99 per month for access to its streaming library with limited ads.